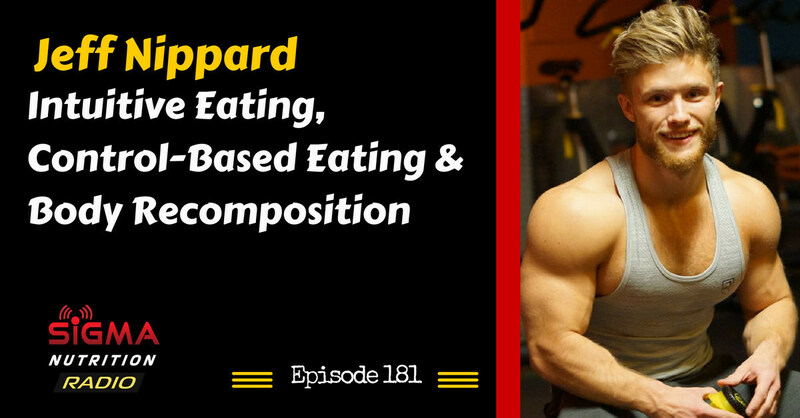 Episode 181: Natural bodybuilder Jeff Nippard discusses an evidence-based approach to intuitive eating, dealing with cravings through an acceptance-based model and how people should view body recomposition in the long-term. Jeff is a WNBF Pro Drug-Free Bodybuilder and internationally qualified IPF/CPU Powerlifter in the 74 kg class. He earned the title of Mr. Junior Canada for natural bodybuilding in 2012 under the guidance of Dr. Layne Norton. Prior to earning the Canadian national title, Jeff was a two-time Mr. Junior Newfoundland title-holder for 2009 and 2010. As a powerlifter, Jeff has claimed a 227.5 kg (502 lb) squat, 152.5 kg (336 lb) bench press (2014 Canadian national record) and a 235 kg (518 lb) deadlift with an all time best Wilks score of 446. With a Bachelor of Science degree in biochemistry, Jeff has gathered the requisite scientific knowledge to compliment his practical experience acquired through training and coaching. Jeff worked as a coach with esteemed online coaching group The Strength Guys through 2014 and 2015 before branching out with STRCNG. Jeff has coached women’s bikini and men’s bodybuilding national and provincial champions, professional natural bodybuilders and nationally and IPF Worlds qualified raw powerlifters. Denny et al. (2013) – Intuitive eating in young adults: Who is doing it, and how is it related to disordered eating behaviors?